The United States Botanic Garden (USBG) is a living plant museum that informs visitors about the importance, and often irreplaceable value, of plants to the earth's fragile ecosystems. To ensure access to the broadest possible audience, the USBG recently hosted its first Morning at the Museum program. This program provides museum access for individuals with cognitive and sensory-processing disabilities by providing pre-visit preparation materials, a calmer visitation period for registered participants and a welcoming quiet "take-a-break" space. Staff and volunteers from the USBG, the Office of Congressional Accessibility Services, the Capitol Visitor Center and the Smithsonian's Office of Accessibility welcomed 18 families to the Garden's current exhibit – Season's Greenings: Pollination Station. To help families prepare in advance of their visit, the USBG developed and provided sensory tip sheets. The USBG's operations team was instrumental in ensuring the Conservatory was prepared for our visitors by modifying certain features to provide an environment with fewer physical stimulants including turning off large fans, plant misters, water fountains, music, hand dryers and sliding doors. 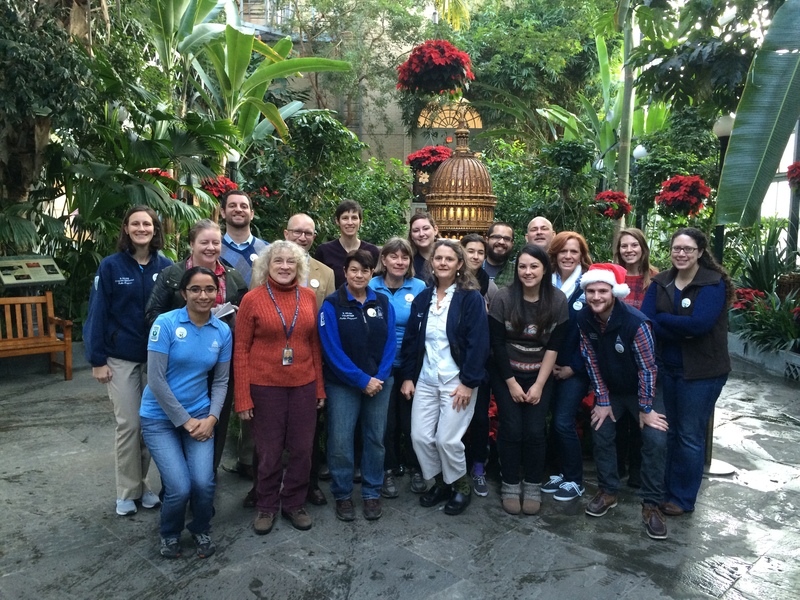 Volunteers facilitated four seasonal discovery carts, which provided tactile and multi-sensory opportunities to explore the model buildings, see and smell cacao as it is turned into chocolate, touch cones from conifers and make living ornaments. "We were so thrilled to see the announcement for the December 6th event! Our child just loves trains. This event makes it possible for us to participate in an enriching experience in an adapted way." "Thank you so much for hosting such wonderful programs. We truly appreciate these amazing experiences and having our family feel so welcome." "We rarely attempt these sorts of trips because of the barriers with my son's disability. Thank you so much!" "Thank you so much for the lovely experience at the Botanic Garden on Sunday. It was so nice to be able to take the boys to see the train exhibit and walk through the greenhouses without all the crowds. There is absolutely no way we could have done it during regular hours. I'm sure it takes a lot of staff time and resources to offer the "Morning at the Museum" program. Please know that the effort is greatly appreciated. I cannot even begin to explain what a blessing that opportunity is for us as a family." Established by the U.S. Congress in 1820, the USBG is one of the oldest botanic gardens in North America. Since 1934, it has been administered through the Architect of the Capitol. To learn more about this national treasure and the programs offered by the USBG, visit usbg.gov.